Katumba, the largest drum ensemble in the North West, is pairing up with Liverpool One, Viva Brasil Samba Shows, The Anahis, and Bring the Fire Project to bring you their most fun, and spooky annual Halloween parade to date! The parade route is through the city centre: starting at 9pm in front of Sainsbury’s on corner of Bold St. and Renshaw St. and continuing down Bold St, Slater St, Wood St, Roe Alley, David Lewis St, Seal St, crossing Hanover St. and continuing on Liverpool One grounds ending on Mathew St/MET Quarter for the big, fun finale! Juliana Landim, Katumba’s Artistic Director says: “The Saturday closest to Halloween has become a tradition in Liverpool, known as the most fun day of the year! And we’d like to believe we have been part of making that happen with our annual Halloween parade through the City Centre, turning the streets of Liverpool into the scary version of Brazilian carnival, where I’m from. 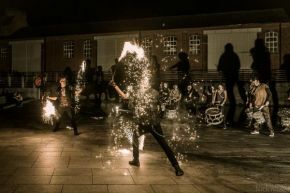 We bring our 70 plus troupe of drummers, plus invited guests (this year Bring the Fire Project, Viva Brasil Samba Show & The Anahis) and we have such a great time bringing our music and moves dressed up in the most creative outfits: this year matching our theme ‘Nightmare on Bold Street’.